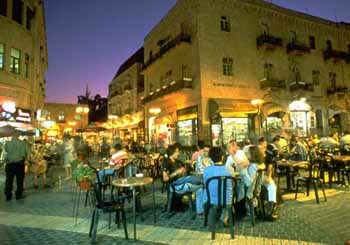 The heart of the city is located around King George Street, Jaffa Road and Ben-Yehuda Street. This is where you'll find a bustling pedestrian mall filled with people from all over the world, restaurants, souvenir shops and street musicians and artists. It is also where you can find some of the imports from America, such as McDonald's. If you want a more "sophisticated" evening out, go for tea at the King David Hotel. To see where the foreign journalists congregate, go to the American Colony Hotel in East Jerusalem. Jaffa Road leads into the Old City. If you head in the opposite direction, you'll pass Mahane Yehuda, the outdoor market where you'll find all sorts of fish, meat, vegetables, fruit and odds and ends. On Friday, the place is really hopping as people stock up on supplies for Shabbat. Up King George Street toward Yemin Moshe, you'll see the impressive Great Synagogue just across from Independence Park and the Sheraton Hotel. Hechal Shlomo, adjoining the synagogue, is the former headquarters of the Sephardi and Ashkenazi Chief Rabbis. Jerusalem is a wonderful city to explore on foot, but it is a large and hilly place and a few of the more interesting and important sites are not really within walking distance of the hotels where most visitors stay. They are easily accessible, however, by bus or taxi. One of the premier "modern" attractions in Jerusalem is the Israel Museum where the fragments of the Dead Sea Scrolls are exhibited in a special building known as the Shrine of the Book. The distinctive white, domed-shaped ceiling of the building is modeled after the clay jars in which the scrolls were found. The scrolls are the oldest manuscripts of the Old Testament ever found. The Museum also has a wonderful sculpture garden with masterpieces by Rodin, Henry Moore and others, galleries with works by modern and classical artists, including Rembrandt, Chagall, Picasso and Miró, and archaeological relics dating as far back as the Early Stone Age. The Museum is also known for having perhaps the world's finest collection of Judaica. Not far from the Israel Museum are many of the Israeli government ministries and the Knesset, Israel's parliament. The Knesset took its name and fixed its membership at 120 from the Knesset Hagedolah (Great Assembly), the representative Jewish council convened in Jerusalem by Ezra and Nehemiah in the 5th century B.C.E. When visiting the Knesset and other government offices, be sure to bring a passport. Security is tight and the lines to pass through the gates are sometimes long. Once inside the building, the highlight of the tour is the State Hall where three tapestries and a mosaic created by Marc Chagall decorate the walls and 12 mosaics cover the floor. Just as most visitors to the U.S. Capitol are surprised when they find few, if any, members of Congress in the chambers most of the time, it is likely the Knesset will also be empty, or nearly so, unless a major issue is being debated while you are there. Unlike Congress, debates in the Knesset are free-wheeling, with frequent shouting and finger pointing. Like the British Parliament, the opposition also heckles the Prime Minister and other government officials. Also nearby are the new Israeli Supreme Court buildings, which have been acclaimed for their contemporary architecture. The area around the Knesset and Supreme Court also has a beautiful garden, Gan Havradim, which is filled with roses from around the world. 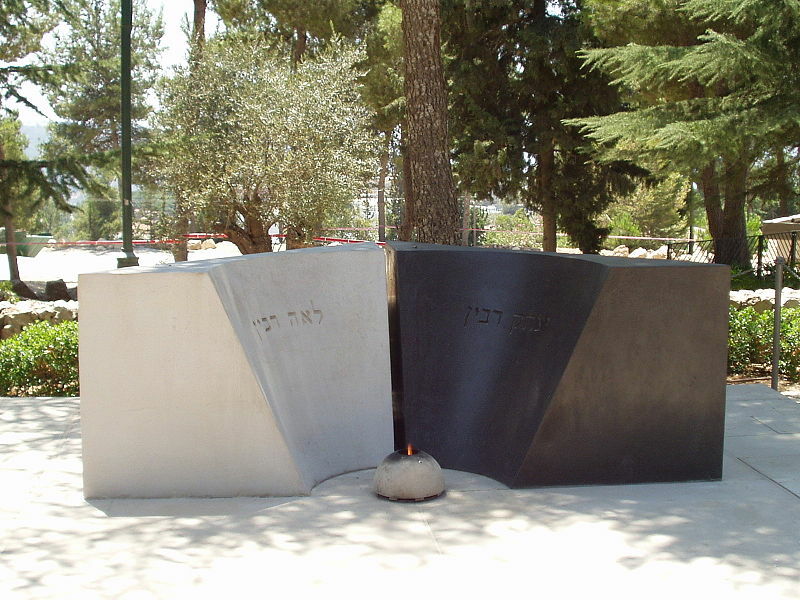 As you head out of the center of town, up the hill on Herzl Street you'll reach the memorial park and cemetery dedicated to the founder of political Zionism, Theodor Herzl, whose tomb is at the summit of the mountain. Along with Herzl, many of Israel's other leaders, such as former Prime Ministers Golda Meir and Levi Eshkol, are buried in the cemetery. Since his tragic murder in 1995, Yitzhak Rabin's grave has also become a magnet for tourists. Israel's principal military cemetery — its Arlington — is also located here. If you've never been to a Jewish cemetery, you'll notice flowers are not placed at the graves; instead, it is traditional for visitors to place small stones on the tombstones. Chagall's stained glass window representing Joseph. One of the world's premier hospitals is about ten minutes further up the road in Ein Kerem. Besides being an internationally renowned medical facility and research institution, Hadassah Hospital is known for the spectacular stained glass windows of its synagogue. The 12 windows created by Marc Chagall represent the sons of Jacob from whom came the tribes of Israel. The hospital, founded by the women's Zionist organization, was originally built on Mt. Scopus. When that area was lost in the 1948 war, the modern hospital was built here in 1962. A little beyond Mt. Herzl is the Israeli Holocaust museum. Yad Vashem was established by Israeli Law in 1953 to commemorate the six million Jews and their communities wiped out in the Holocaust. It has the largest and the most comprehensive archive and information repositories on the Holocaust, housing more than 50 million pages of documents and hundreds of thousands of photographs and films. My people gone, alive no more. I arose with a shout: "Oh no!, Oh no!" The dream I dreamt -- It has become so! "My people, dead! Wherefore and why? 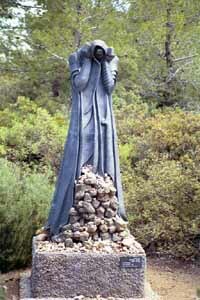 They are no more -- lament the sorrow! Wherefore, O God? Why, Adonai?" The Historical and Art Museums, as well as the Hall of Remembrance, the Valley of the Communities, the Children's Memorial, and other monuments attest to the tragic events that befell the Jewish people and instruct visitors to Yad Vashem on the uniqueness of the Holocaust and its universal lessons. The Hall of Names is part of an effort to collect the names of every Jewish man, woman and child murdered in the Shoah. The Memorial Plaque of Oskar Schindler. Yad Vashem also pays tribute to the courageous non-Jews, such as Oskar Schindler and Raoul Wallenberg, who risked their lives to save Jews from certain death. These rescuers are awarded the title of Righteous Among the Nations and given a certificate and a medal with the Talmudic inscription “Whoever saves a single soul, it is as if he had saved the entire world.” A tree is then planted on the walkway, marked by a plaque bearing the name and nationality of the Righteous Person. Some of the most impressive sites in Israel are natural ones. In Jerusalem and its outskirts are some magnificent forests. 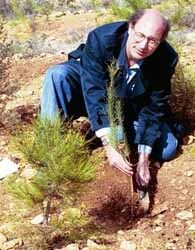 The Jerusalem Forest is not far from Mount Herzl and is an excellent place to physically contribute to the greening of Israel by planting your own tree. Americans are honored throughout Israel. For example, in Tel Aviv, Abraham Lincoln and Woodrow Wilson have streets named after them. George Washington Street is in Jerusalem and Martin Luther King has a street and memorial in his honor in the Galilee. A statue of Lincoln is in Ramat Gan and a replica of the Liberty Bell was built in Jerusalem's Liberty Bell Garden. This forest is also home to a special memorial to President Kennedy. The building resembles the stump of a tree that was chopped down in its prime. It consists of 51 columns in a circle, representing the 50 states and the District of Columbia. Inside, an eternal flame burns in front of a bust of JFK. The surrounding trees were also planted in the President's honor. Even this lengthy description of Jerusalem does not do justice to all there is to see and do. Get off the tour and immerse yourself in the city. Until you return, you will never be in a place like this again.